In between polar vortexes and blizzards, we're gifted with some unseasonably mild days during New England winters. Once or twice we even synced up with temps on the West Coast, in between their very troubling heat waves. I like to take advantage of those days to go back to classic fall outfits, like this laid back look here. Must-have basics like a plain black riding boot, the 'Toothpick Jean' from J. Crew, and a Ryan tank from Everlane are a great foundation for a casual but put-together outfit. Just add a fun blazer - this one is Willow & Clay - and some interesting jewelry to bring in some texture and interest. I find myself reaching for this choker from JewelMint a lot when I'm in a hurry and want something that makes a statement but doesn't require me to think about how it works with the rest of my outfit. The calf-hair and leather satchel from Cynthia Rowley was a perfect match! Fun fact: This is the outfit I had on for the most recent hair tutorial I did for Qwear! Pictorial, rather; I wanted to walk through two different types of heat styling - waves with a waving wand and flat-iron curls. Check it out for tips or product recommendations, and definitely let us know what you want to see or read more about in the sixth and final post in the series! Last week the marvelous Riese delivered her third ever State of the Autostraddle Union. The first was in 2010 and it's truly something else to see how far the team has come over the years. Since folks process cold hard numbers better than most anything else, how's this for a measure of success? "This past month, we reached a milestone I thought it’d take another four years to achieve – we got 1.06 million unique visitors in December. You know how many unique visitors that is? OVER ONE MILLION, that’s how many!" Being Braver: We want to be able to take risks in our writing — to eschew safe groupthink, propose new solutions and espouse progressive politics. Therefore this can’t be a place where ideas are quickly taken out of context and dismantled — it must be an environment where ideas can be debated respectfully and mistakes can be made. Intersectionality: Our little universe made great strides in the area of trans* visibility last year, but there’s still so much work to be done. Locally, Trans*scribe did so much to expand our understanding of trans* issues beyond “101? and brought many new writers into our world, but it seems many activists are ready to hang up their hats ’cause there’s one trans woman on a TV show. No — as far as rights and protections for trans people goes, the work has only just begun. However, this year we’ve experienced firsthand and watched so many of you undergo a significant transformation w/r/t how you talk about trans* people, and your open-ness to this education has been inspiring — and in 2014, we hope that white people will understand and accept that it’s possible white people have as much to learn about race issues as cis people do about trans* issues. This means understanding that people of color are the experts on PoC experiences, that learning about racism in school or having friends of different races doesn’t mean you’re qualified to speak over PoC and that engaging in PoC narratives with an open mind is imperative for anybody invested in progressive politics and a genuinely inclusive LGBTQ Rights and Feminist movement. We have a lot of work to do ourselves and our site needs so much improvement in this area too. We’re really desperately even more interested than ever in submissions and Contributing Editor applications from people of color, trans* women and people with disabilities. Please submit! 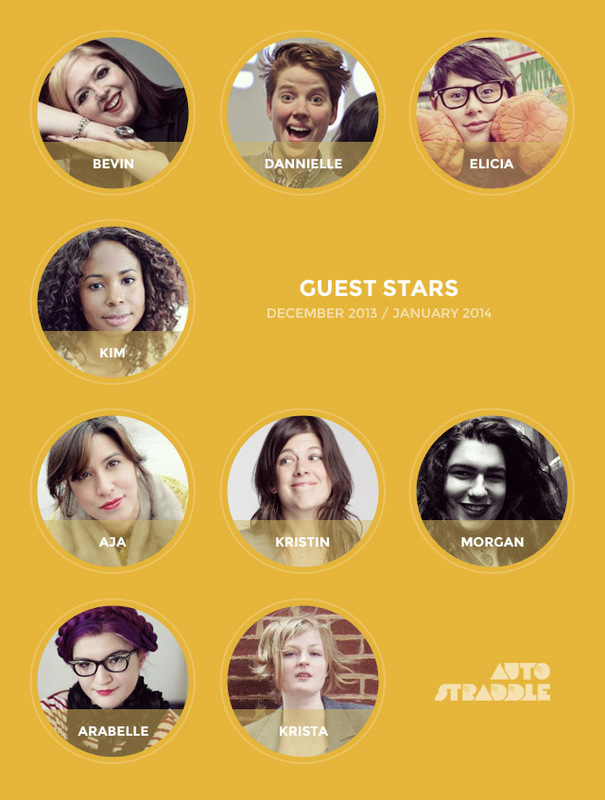 Getting Back to Our Roots and Being Weirdos: When Autostraddle was young it felt like we were in a room with our closest friends and could be as exactly as weird as we honestly are. Over time, as our closest friends invited their closest friends who invited their friends, we became more aware of an audience. Now that we’re in a room with over a million of our closest friends, we’ve realized that we’ve started to behave the way people usually do in public — more restrained, more likely to second-guess ourselves, more worried about whether this outfit looks stupid. But we know that there’s a reason all of you cared enough to show up here in the first place, and that the truth is our weird interests and bizarre loyalties and counterintuitive understandings of the world are the best and most honest parts of ourselves. We owe you — and ourselves — to always try and be the best and most honest people possible. So we’re going to try to go back to dancing like nobody’s watching and hitting “publish” on that weirdo thing that we hope our ex-girlfriend’s ex-girlfriend doesn’t read, because if we’re not willing to do that, then what’s even the point. Be back later this week with more bundled-up looks, since it looks like we're getting another snowstorm tomorrow, in addition to Saturday's very pretty snow.